The new Grant Park (Chicago), designed by Edward H. Bennett, is shown here looking from Monroe Street at the edge of the Illinois Central Railroad tracks (right, not shown) north to the 1917 Peristyle designed by Bennett. This has been replaced in the 2000's by Millennium Park. The summer image includes plantings on the classic balustrades. 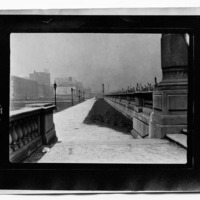 This fascinating image shows the character of the structures north and northwest of the new park, with the 1917-built Peristyle on the upper right, at the north end of the new park, inserted between Michigan Avenue and Illinois Central Railroad tracks, not in view below on the right, and shielded from sight by the new balustrade. The new street lights, the limestone balustrades, the fountain, all reflect Paris models (see the images of similar features in the Tuileries and the Place de la Concorde from Bennett's study photo collection). Bennett, Edward H. (Edward Herbert), 1874-1954, “Grant Park, Chicago, north of Monroe Street,” Digital Collections - Lake Forest College, accessed April 26, 2019, http://collections.lakeforest.edu/items/show/1904.